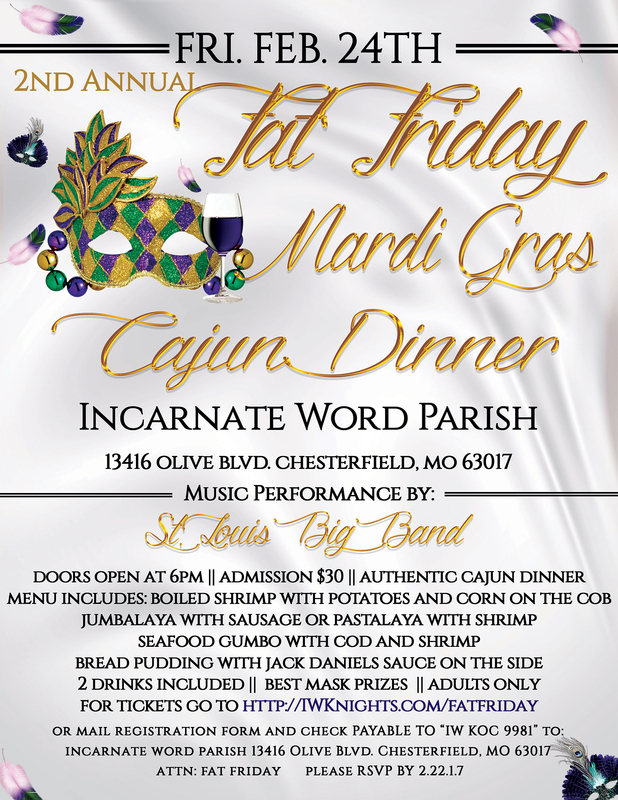 Come on down to Incarnate Word Parish’s Kent Center on Friday, February 24th, 2017 and experience a spectacular and authentic Cajun dinner prepared by Incarnate Word bayou natives. Then, listen and dance to big band music from St. Louis Big Band, a unique 7 piece band that brings the fun and funk! No need to travel far – get your Mardi Gras fix here! Want to get tickets to the 2nd Annual Fat Friday event online? CLICK HERE. Promo Spot now airing on Covenant Network stations in St. Louis…. Click on Image above for full image. A huge THANK YOU to everyone who made the Fat Friday Cajun Dinner & Mardi Gras Party such a smashing success last year (2016). A most wonderful time was had by all! As Fr. Tim Vowels, Pastor of Incarnate Word Parish said in his column on February 21, 2016……. It was indeed a festive evening in the Kent Center for the Knights of Columbus Mardi Gras Party. The IWKnights were aided by a few parishioners in helping to spread the word about the party. Over 200 people attended which I thought was excellent, considering this was the first time for the event. There were people of all age ranges, which prompted a few of the “younger” attendees to comment on how nice that was to be able to be with parishioners they might not normally see in their own social circles. There also was a band providing great music. I especially enjoyed the shrimp. That is saying a lot coming from a not-fond-of-fish person! It was a wonderful evening and many of those who were there commented to me that they would definitely be there next year! (hint hint knights.) Thanks to all who made this possible and all who came. Again, thank you to everyone who made the Fat Friday Cajun Dinner & Mardi Gras Party such a smashing success this year. We had 240 tickets sold and a most wonderful time was had by all! See you all for the Fat Friday Cajun Dinner & Mardi Gras Party on February 9, 2018 !! !